So this week I wanted to write about something I am currently working on in my spare time. It is a knitting project inspired by a Sinterklaas gift/surprise I received. The girl who gave me the gift had made her own thread by spool knitting all different kind of colors. This thread she used to knit a small fabric sample. 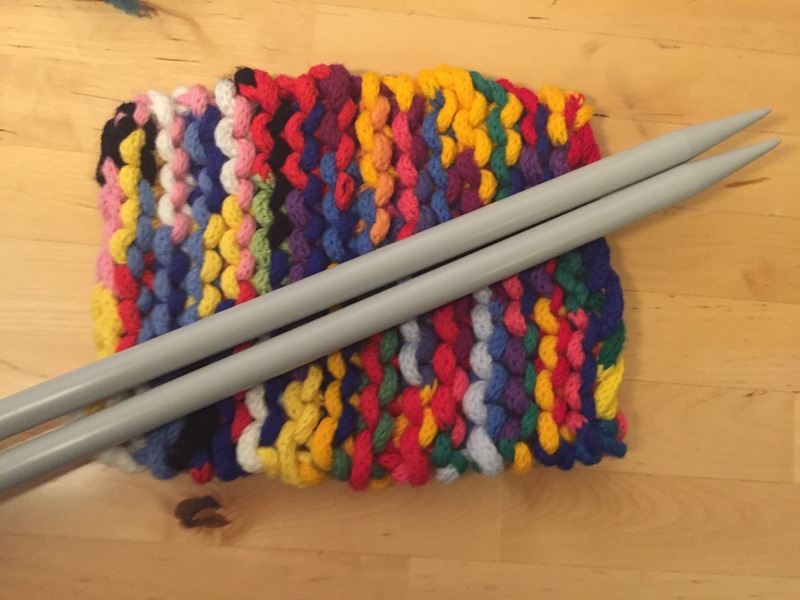 The ‘actual’ gift were the two needles she knitted it with, together with some more needles and other knitting essentials. My reference, the knitted fabric sample. 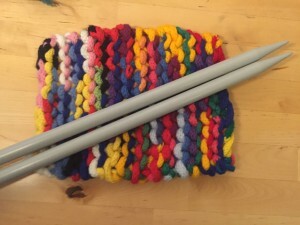 My project: knitting, knitting and more knitting! For my own project I decided to ‘spool knit’ two balls of wool into two threads, so I can use those to possibly create something that is still undecided. However I plan to update you as soon as it is finished! Currently I have finished the first ball, a light turquoise color and I am working on the second one, which is a darker azure kind of color. The two colors next to each other. As you can see this project is far from finished, although I expect the knitting will go quite quickly, the spool knitting part takes a lot of time. 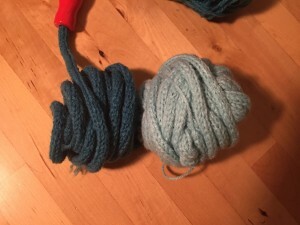 However I mostly wanted to share the idea of using a spool to create a thread first, and then using it to knit. 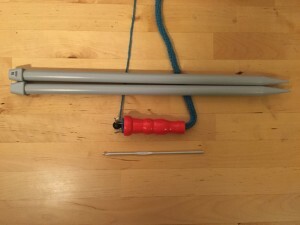 In the picture below you can see the tools I am using for this project. At the top are the two knitting needles I will be using after I have finished the second ball of thread. In the middle is the spooling tool, to use it you also need a crochet needle. I am using a 3.5 mm needle, but that is just because I had it lying around.